One of my absolute favorite things to get for our kitchen is gadgets. I LOVE gadgets. Seriously you ever go to Target or Sur La Table or anything similar I will always veer towards those types of products. At the large Bed, Bath and Beyond stores that huge wall of kitchen gadgets is my favorite thing. No matter how many times I've looked there I must look again! That's why I love all the amazing gadgets that the Pampered Chef has and they always comes out with new fabulous ones. Starting off with my three top of the heap, all time favorites that every kitchen must have ... I present to you the Mix 'N Scraper®, Mix 'N Masher and the Mix 'N Chop. These bad boys are the must haves in any kitchen. I have all three sizes of the Mix 'N Scraper and they all get used multiple times a week. The Mix 'N Masher is great for mashing up Kevin's avocados for the week and I'm definitely using the Mix 'N Chop tonight to take care of the ground beef for our tacos. If you know a Pampered Chef fanatic ask them about their Mix 'N Chop, there will be rave reviews! Certain gadgets you feel like you would never use and you just can't imagine actually owning them. Well here are some random gadget you think you might not need but would actually get a lot of use out of. The Fruit & Cheese Cutter is one of those OMG it's so much fun but seriously I'd never use it items right? Well I'll have you know since I got them in the fall I've used them a dozen times. I know that doesn't seem like a lot in such a big time span but from something oddly unique like those guys I think it is. Every time I used them I was making pretty cheese and sausage for some sort of get together. I'd slice it to the thickness I wanted and then cut away with the shapes, then Kevin and I would use the leftover bits for a salad or tacos or something. People LOVED the shapes. They looked dynamite on the appetizer kebabs I made for Gamma Phi trivia night. The Avocado Peeler is another gadget that gets a surprisingly large amount of use in our house. I'm using it at least once a week, twice if Kevin decides on getting another avocado. Microwave Grips are fantastic! You might be thinking oh my pot holders work just find ... and then you plunk your thumb right in to that yummy bowl of soup because of those big bulky pot holders. 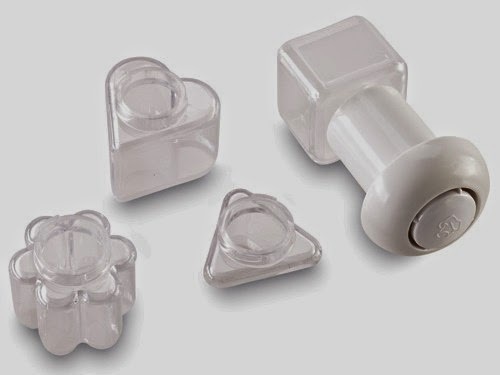 See you do need these fantastic little Microwave Grips after all! The Easy Read Measuring Colander is a totally go to product for me. As you can see it's great for being able to dump stuff out of a can and rinse. Plus the bottom is the perfect size to fit into a tuna can and press out all the excess liquid. Last but certainly not least are three of my kitchen work horses. These three gadgets get the job done all the time in my house. Honestly I used to not be a big fan of the Measure-All® Cup. My mom has had one for years and I never really used it but since I've gotten my own kitchen I've started using it a TON. It's a great quick liquid measuring tool when you flip it over but the best part is using it for things like mayo and peanut butter. You just put the right amount in and press the mayo or whatever into your mixing bowl. No fuss, no mess and you get every last bit! Before getting my Pampered Chef kit we never used fresh garlic in my house, maybe once and a while mom would get the minced garlic but it was always dried. Using fresh garlic that I pressed with the Garlic Press has been life changing. There is so much more flavor! It's nice because you can put each clove into the press with the skin and all. The little cleaning tool helps to get every last bit plus I've used it for a ton of other tasks, like getting out mini desserts from the Mini Muffin Pan. This Nylon Turner is a favorite too. The way it's designed makes it really easy to get items out of your pans in one whole piece. Plus it's nice and long for items like pancakes and larger pieces of fish. 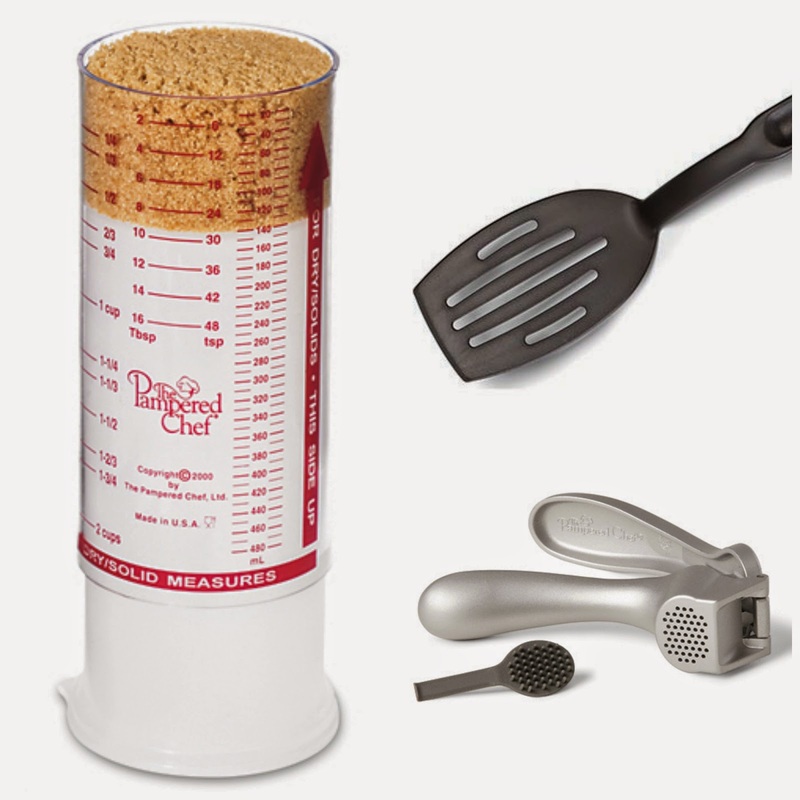 These are just a few of the must have Pampered Chef gadgets! Are you a gadget person? What's your favorite from the Pampered Chef?